Sla Boutique Hostel i Phnom Penh, Cambodja: Reservér nu! 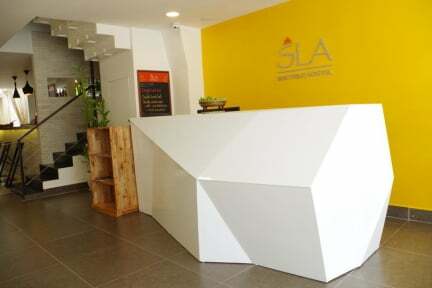 Sla Boutique Hostel is a modern hostel nestled conveniently in the center of Phnom Penh city that offers travelers a place to unwind and meet people in a community environment that is clean, friendly, and affordable. Although our street is nice and quiet, it’s just one block away from a vibrant neighborhood filled with restaurants, cafe, clubs, street food vendors, and bars. It is also close to the city’s major attractions. Traveling away from home can be a scary experience; therefore it is so important that our guest receives our warmest hospitality. We are open 24/7, with front desk staff to assist you at all times during your stay with us. In attempting to conserve energy and be more environmentally conscious, our hostel uses solar panels to heat our water system. 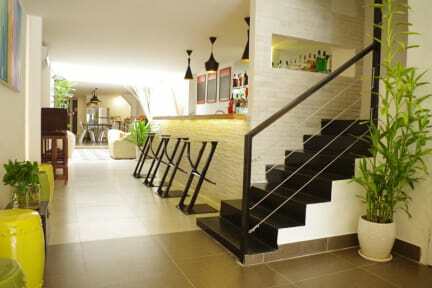 Our hostel offers four different types of rooms, all modern-day style, and totaling 48 beds. There are 1) girl dorm rooms 2) boy dorm rooms 3) co-ed dorm rooms and 4) private double rooms with shared bathroom. In the dormitory room, there are two kinds of bed: Basic bed with 1.0 meter wide for single occupancy only & Standard bed with 1.6 meter wide for 1 or 2 guests. All rooms are equipped with air conditioning, hot water shower, and personal lockers. Towels are available for rent for $1 USD. We have 24-hour front desk, TV, dvd player, board games, and free WI-FI are available in the communal area. Our kitchen has basic cookware, dining ware, utensils, and other kitchen appliances (portable gas stove, oven, microwave, electric grill, fridge, electric water kettle, and coffee maker) that our guests are welcome to use. Guests can order food from 7am til 8pm.